Thanks to Dr. Shahrzad Ehdaivand, Women & Infants Hospital & Warren Alpert Medical School of Brown University, for contributing this case. To contribute a Case of the Week, follow the guidelines on our Case of the Week page. (1) In our popular Stains chapter, we have updated these topics: AMACR, Claudin6, EMA / MUC1, IgH, mTOR, PD-1, PU.1. 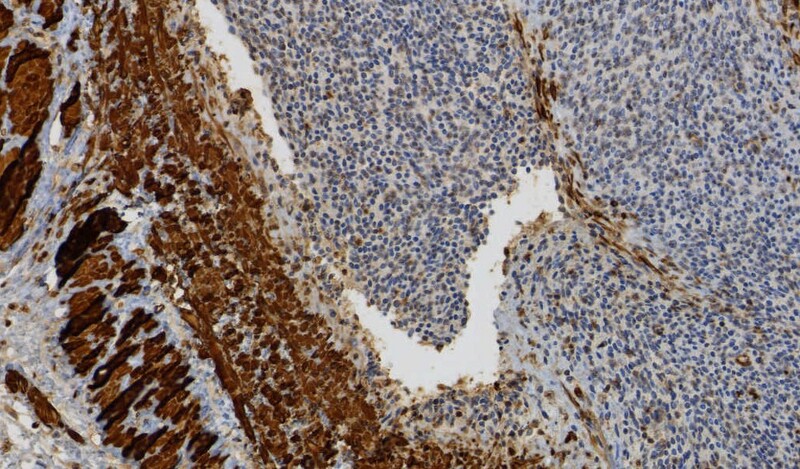 We have also updated CD133 from the CD Markers chapter. (2) The Ovary-nontumor chapter has now been updated, based on reviews by Mohiedean Ghofrani, M.D. and Shahidul Islam, M.D. The Colon tumor chapter has also been updated, based on reviews by Jela Bandovic, M.D., Shilpa Jain, M.D. and Charanjeet Singh, M.D. (3) Our Feature Page for the month highlights Diagnostic testing / reagents, and includes Advanced Cell Diagnostics, Inc. (ACD), bioTheranostics, Covance, Epitomics, Horizon Diagnostics, Leica Microsystems and Ventana Medical. Also check out our new monthly Mystery Image, on the right side of the Home Page. A 53 year old woman had a hysterectomy for vaginal bleeding. 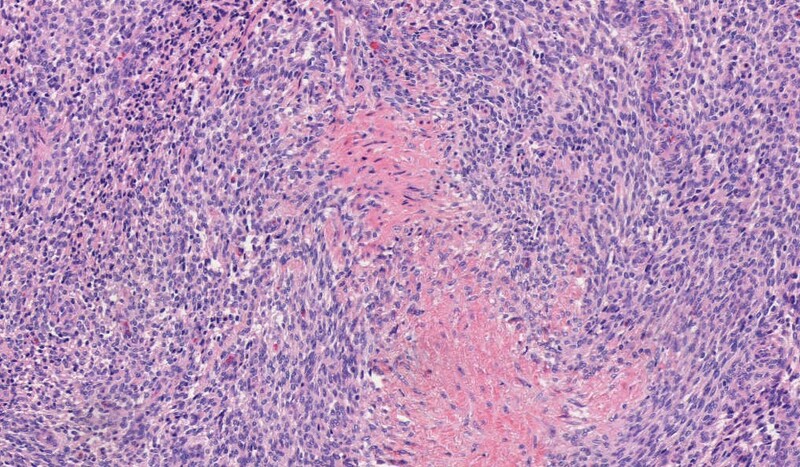 Endometrial stromal sarcomas, as in this case, often have tongue-like infiltrating margins and lymphovascular invasion. 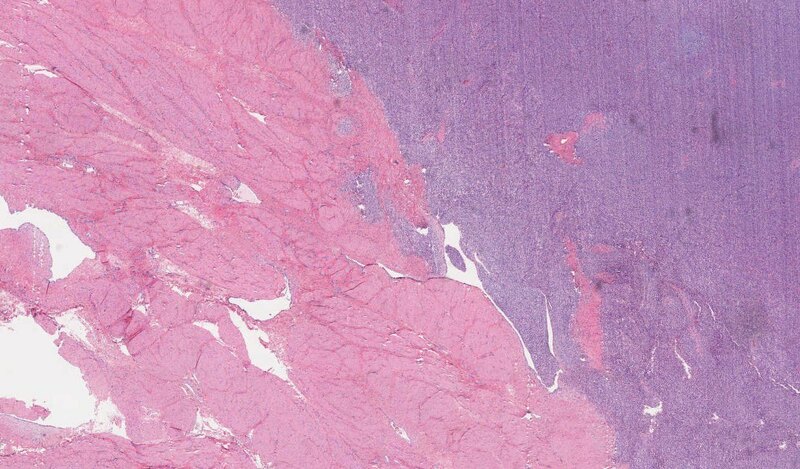 Low grade tumors resemble proliferating endometrium with uniform cells intimately associated with prominent arterioles. 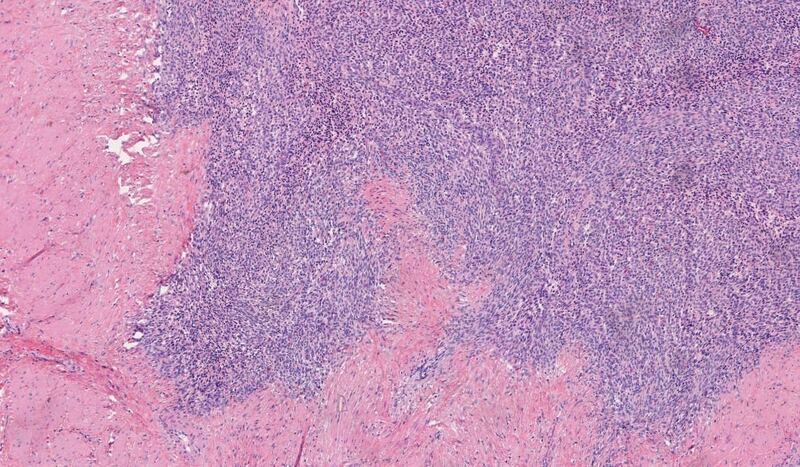 There is usually little cytological atypia or pleomorphism, and mitoses are scanty. The JAZF1-JJAZ1 fusion transcript is present in 50-60% of cases (Am J Surg Pathol 2007;31:1277). 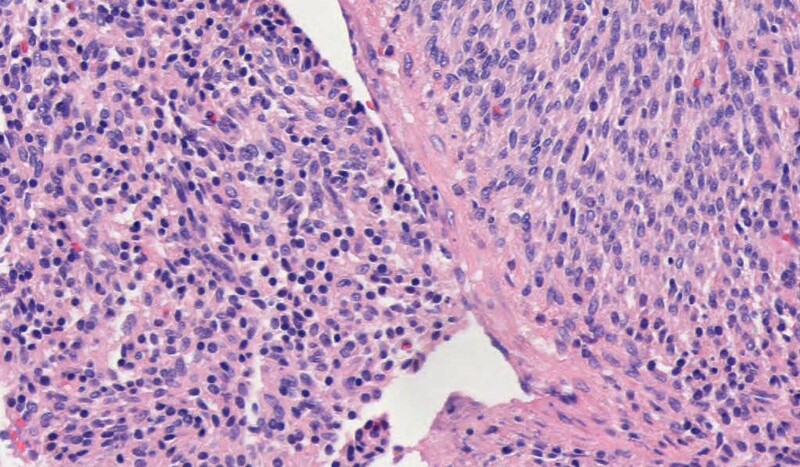 In contrast, undifferentiated endometrial sarcomas are frankly malignant, and lack specific differentiation and any features of normal endometrial stroma. They often have myometrial invasion, hemorrhage and necrosis, as well as marked nuclear pleomorphism and high mitotic activity. 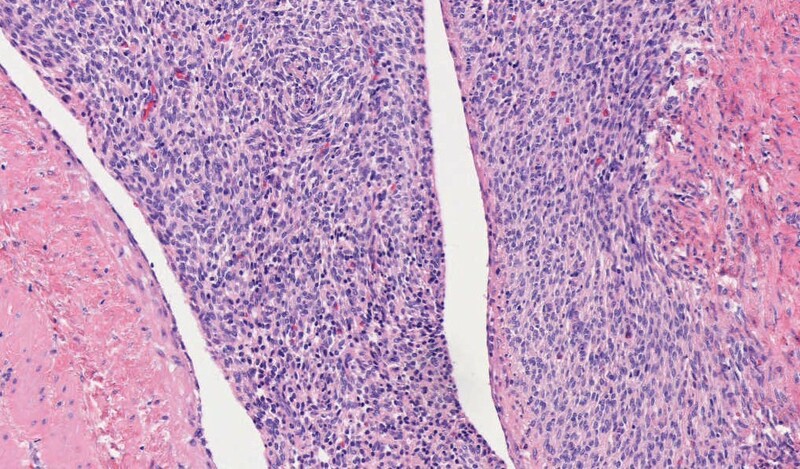 These tumors may have the YWHAE-FAM22A/B genetic rearrangement (Am J Surg Pathol 2012;36:641). 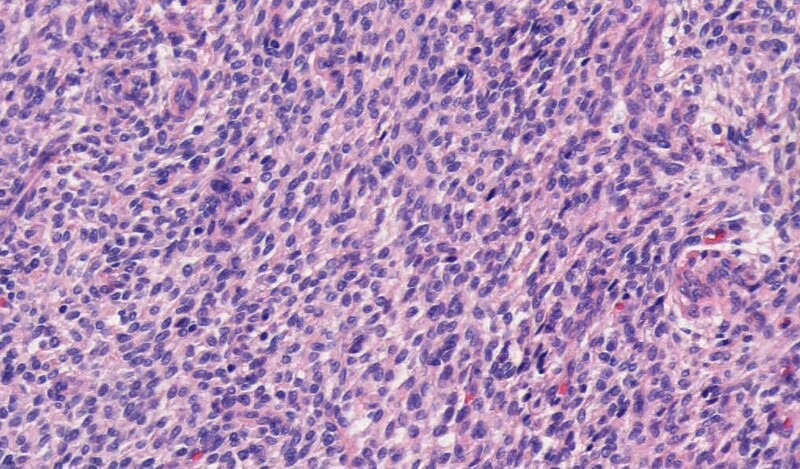 In low grade endometrial stromal sarcoma, even after hysterectomy, there is often slow clinical progression with repeated local recurrences in up to 50%. Death due to disease occurs in 15%, often due to lung metastases, which may occur 30 years later.